It came as no surprise that he decided to make the trip. Of course he did. He’d heard the stories and seen the pictures. He’d even helped collect change to fund previous trips in his younger days, something of a tradition in his church. But at age 14, Beau Zuvers wanted to experience it for himself. The destination was Bonesteel, South Dakota, a trek the group has made every year since 2009. More specifically, they aimed to reunite with the Lakota Native Americans, a band of the Sioux, living on and around the Rosebud Reservation. Certainly no strangers to the tribe, the Living Hope Free Methodist Missionaries were looking to build on those relationships established on past visits. Relationships that took work to create. Clark doesn’t view those to whom he ministers that way, though. “There’s only one race and that’s the human race.” Clark proclaimed. Perhaps it’s this approach that’s led to the diversity of his missions program. Just this year, Living Hope teamed with the Alvarez Ministry, run by Fayette natives Mary and Joel Alvarez, to send missionaries to Mexico. With the capacity to house up to 20 people at a time and the will to send people there, the collaboration was a smooth one. Settling in near the town of Monterrey, the Living Hope group handed out food and hygiene products to the locals. Such luxuries aren’t always readily available to residents of the area. In fact, some of them actually live in 12 by 12 foot rooms. In the afternoons, the group would minister to all who would listen. They found that the people were quite receptive to their message. Mary Crisenbery in particular was touched by the extent to which their presence affected the locals. Some mission work doesn’t require breaking through the language barrier, though. Ashley Kendal and the mother daughter combination of Penny and Klarissa Crisenbery have volunteered for two years running at the Love Packages Ministry stationed in Butler, Illinois. The three women, in conjunction with the ministry’s goal to ship as much Christ-centric reading materials throughout the world as possible, spent most of their time packaging “in a factory-like setting,” per Kendal. Klarissa, currently in her junior year of high school, was taken aback by the dedication of those working within the ministry. Kyle Clark shares this enthusiasm in his own missionary work, especially in his dealings with the Lakota. Clark always attempts to coincide his church’s visits with local pow wows, so that those accompanying him can get an idea of the Lakota culture. Religiously, they are a very ceremonial people, although many within the tribe have adopted Christian elements to their belief systems. This didn’t make it any easier to break the ice with them, however. Penny’s husband, Jeff Crisenbery, remembers the moment he realized they had earned the trust of the Lakota. After a Tombstone Unveiling Ceremony, held in the Spring to commemorate a person who died in Winter, the Living Hope volunteers were invited to an accompanying dinner. He sat next to an elderly Lakota woman. “She turned to me and said, ‘I can’t believe you whites would eat with us at our table.’” Jeff reminisced. These experiences, as unique as they may seem, appear to actually be quite commonplace for those who take on missions. The question is, did it impact Beau Zuvers’ life? Such a feeling is not uncommon to first time missionaries. The emotions elicited from the experience took hold of Zuvers. Jeff Crisenbery noticed immediately. And he is being made. 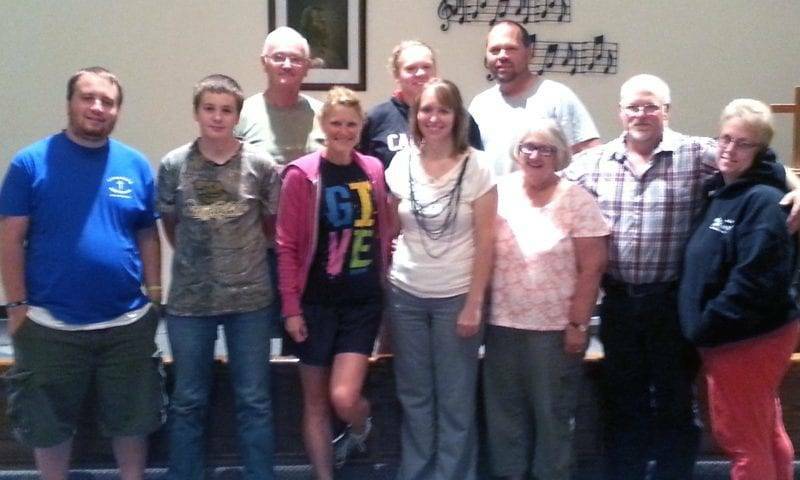 Be the first to comment on "Mission Work Serves As Living Hope For West Unity Church"